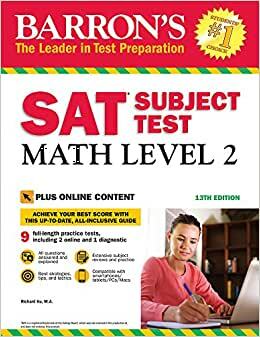 Barron’s SAT Subject Test: Math Level 2 with Online Tests features full-length practice tests with brand new questions, additional online practice, and updated content review. Content review covers several types of functions; transformations and symmetry; conic sections; polar coordinates; three-dimensional geometry; counting; complex numbers; matrices; sequences and series; vectors; statistics; probability; and much more. The content of this book is comprehensive, but some examples in the 13th edition (latest edition) are incorrect. For example on page 158, problem 10 has two valid answers, A and E.
Hopefully next editions will correct some of these mistakes. The book is very good. It was the main reason that I got an 800. But the problem with the book is that the explanations to the answer choices can be very vague or not make sense at times. It goes into more than any other test prep book but in terms of its presentation the barons math level 1 is better. 5.0 颗星，最多 5 颗星Good source for SAT preparation. 5.0 颗星，最多 5 颗星Item arrived in great condition. Item arrived in great condition.